If you thought getting solid colors on all six sides of a Rubik’s cube was stressful, then don’t try this at home. There’s a new art form on the scene – for visionaries who clearly have too much time (but a good eye) on their very agile hands. 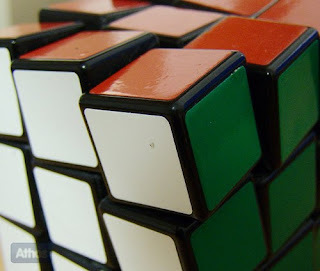 Rubik’s Cubism has actually been around almost as long as the little vibrantly colored toy itself. But since emerging in the mid-80s, true masters of the movement have finally become apparent. The top guys at the craft are Robbie Mackinnon and a street artist who fittingly goes by the retro moniker Space Invader. The Huffington Post compiled a slideshow of some of the greatest works from James Bond villain Jaws to the Dalai Lama. You might have to step back from your computer and squint a little bit to get the full impact of a few of the pieces, but the results are as mind-boggling as solving the cube.